1. Preheat oven to 350 degrees. Spray mini bundt pan with non-stick cooking spray. 2. Prepare boxed cake mix according to the instructions on the back of the package. Combine eggs, water, butter, and mix in a large stand mixer- beat on medium speed until well blended. 3. Bake for 20-25 minutes or until cakes are golden. If unsure, use a wooden toothpick to test the centers. 4. Make frosting by combining butter, sugar, and salt. Beat till blended. Add the milk and vanilla while beating for an additional 3 to 5 minutes or until smooth and creamy. If buttercream is too thick, add a small amount of milk until desired consistency is achieved. 5. Transfer buttercream to a piping bag with a medium-sized open star tip attached. 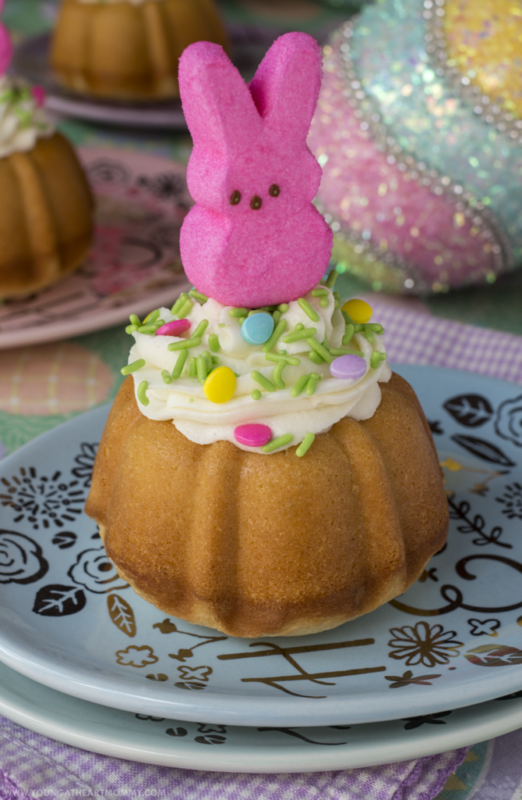 Decorate each bundt cake with swirl of frosting, spring themed sprinkles, and a PEEPS® marshmallow bunny. Sweet. Simple. Satisfying. 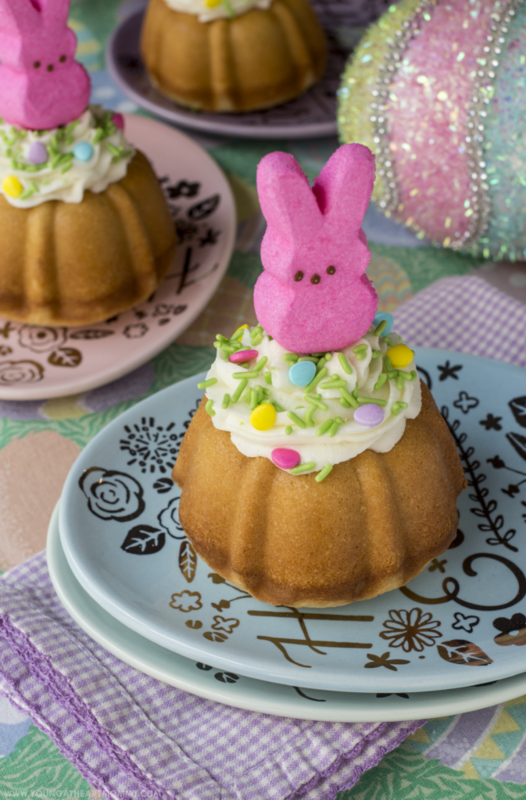 Easter desserts don’t have to be overly complicated or over-the-top to make a statement. 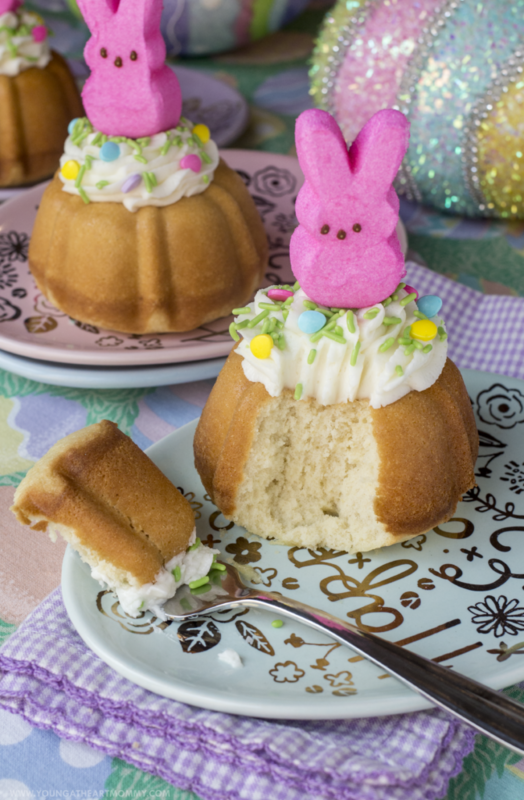 A batch of homemade vanilla buttercream can take you a long way and these festive bunny cakes are too cute not to make this spring. What are your favorite things to do when the kids are away and mom can play? My daughter would just LOVE this! I might have to make this for her. They are adorable and easy to do too.